Of the basic influences on your salary, there are five that have the greatest impact. Most people can rattle off employer, location, sector and seniority with ease but what about the value of your head hunter? Based upon our analysis of tens of thousands of roles, the salary variance in just the top 5 agencies advertising during 2014 can be as great as 20%, and that’s before they even start negotiating on your behalf. When your mobile shows “Blocked Number” it generally means one of two things – a head hunter is calling or the estate agent wants to find out if you’re still looking. Any call from a head hunter is an exciting event. Their interest in you confirms the choices you’ve made and your value in the market place, and the fact that they have chosen you amongst thousands of candidates appeals to your sense of exceptionalism. It is a tempting route just to follow passively in to a recruitment process, either to boost your ego or to see whether the grass is truly greener on the other side of the fence. But before you spend time and risk your application coming to the attention of your current employer, let’s consider where the recruiter sits in the value chain. There are a few common misconceptions about recruiters: they always get paid a share of your salary as a reward for closing the hire; this share comes from the same budget as your salary; they care about your ongoing development after an unsuccessful first interview. Remember that if the first employer doesn’t want to invest time in you, it’s highly unlikely that the recruiter will prioritise you as a candidate for the next opportunity unless you are an expert in your field. But let’s dig one step deeper. Head hunters are deal-based sales organisations. LinkedIn and other CRM systems have put incredible pressure on their previously lucrative walled garden. Agencies like Heidricks have over a million candidates on their database – a brilliant sales pitch a decade ago, but miniscule in comparison to today’s professional social networks. The pressures recruitment agencies are under is unprecedented, and new business models such as Bounty Jobs which are dissolving the rigid Approved Supplier List process and empowering the corporate recruiters. These pressures are driving agents to accept lower commissions, or to take more demanding roles. The ROI of an internal recruiter sourcing candidates for an employer has shot up compared to external routes, although as with any sector, great agencies will always retain their key clients. This is reflected in how the margins in the sector changing. Head hunters might accept salary recommendations for vacancies that they know are not competitive; but still it is their job to sell this to you. Those agents that recruit good candidates at a lower cost are obviously going to be given more business. We set up Red Unida to help candidates make straightforward comparisons between opportunities. In the first instance, this means seeing simple data on the big choices – employer, sector, location. As we grow, the data behind the logic will offer more depth on decisions such as speed of promotion in certain firms, ease of switching between industries and gap analysis between you and your seniors. The data comes from tens of thousands of advertised roles in the sector; these data are extracted and presented in graph format. So what does it show about Investment Banking? These calculations include middle and junior roles in some cases, which in turn will bring down the averages but when it comes to advertising vacancies all but one of the top ten are recruitment agents. Does this mean that only head hunters advertise their roles? Not at all – we have hundreds of roles from the top banks such as Deutsche, BOAML, BarCap and others in our listings. 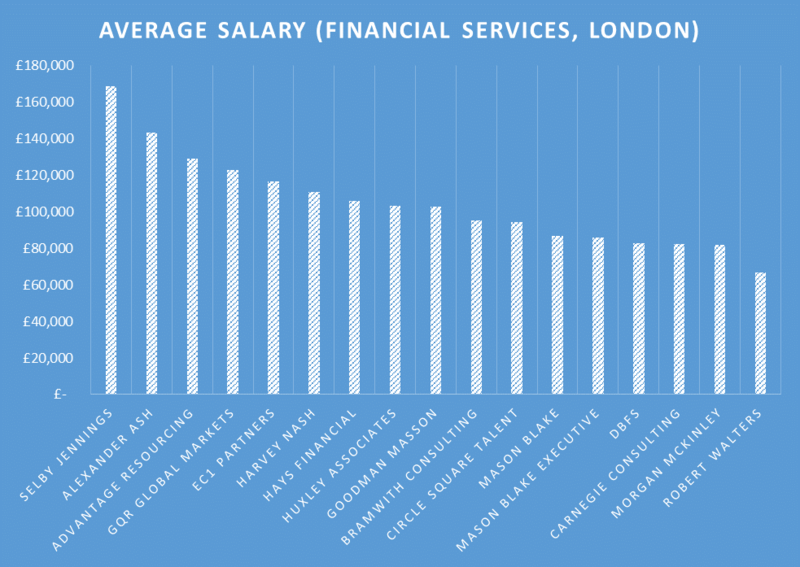 Does it mean that salaries are presented as more favourable when published by recruitment agents? Possibly. The most likely situation however is that when an employer wants to recruit at the £100,000+ range, the ROI is better when using a third party specialist and therefore the higher paid roles go out to the agents. Whatever investment you are due to make – education, career, property, spouse – you need to remove as much noise as possible from your calculations. Not all head hunters are born equal, so make sure you choose well.